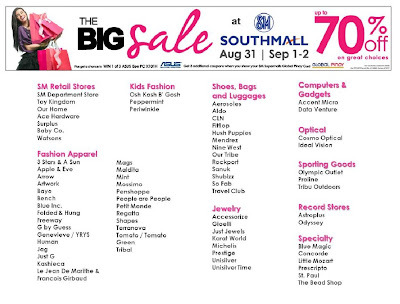 Home / 3-day sale / christmas / Global Pinoy Card / Hypermarket / online / promo / raffle / shopping / sm advantage card / sm cinema / SM Department Store / SM Foodcourt / sm malls / SM Southmall / sm supermarket / The Big Sale / Southern Shopping Craze with SM Southmall's 3-Day Sale! Southern Shopping Craze with SM Southmall's 3-Day Sale! 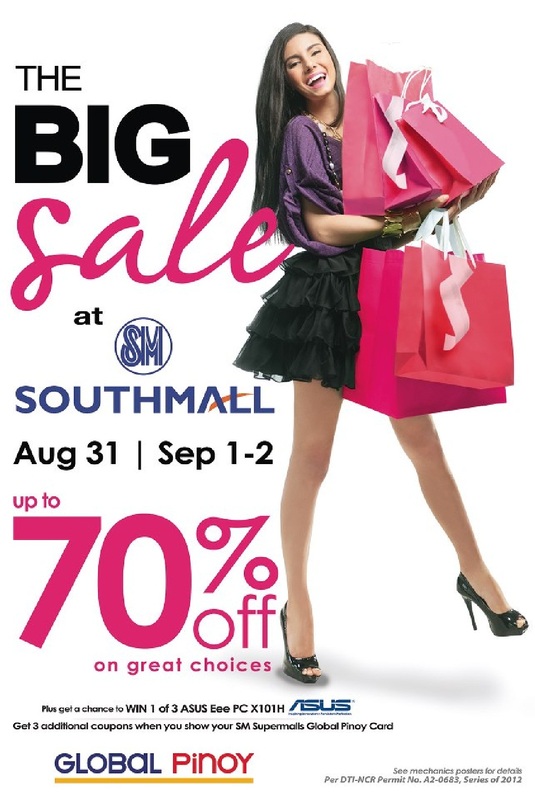 My dear southern friends, be ready this coming payday weekend because with SM Southmall's 3-day sale, your hard-earned money will surely have a good place to go. From the wide array of apparels and home wares, this coming weekend sale might be the your perfect time to do your early Christmas shopping! Upto 70% off on great choices, if ever I wakes up early tom, this will be my very first time to do shopping on this part of time. I was able to see some of the stores who will give great discounts to their customers, I'm actually excited to be there! I'm planning to look for some cold season clothes, so I hope that I'll get there in time to have the right sizes for me. 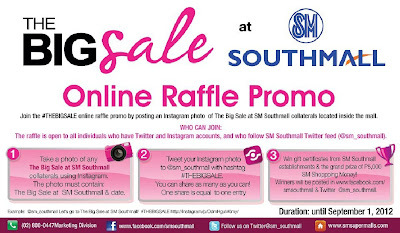 I also read on their Facebook page, that there'll be this The Big Sale at Southmall Online Raffle Promo where winner can take home some sweet gift certificates from SM Southmall establishments and Php5,000 shopping money. 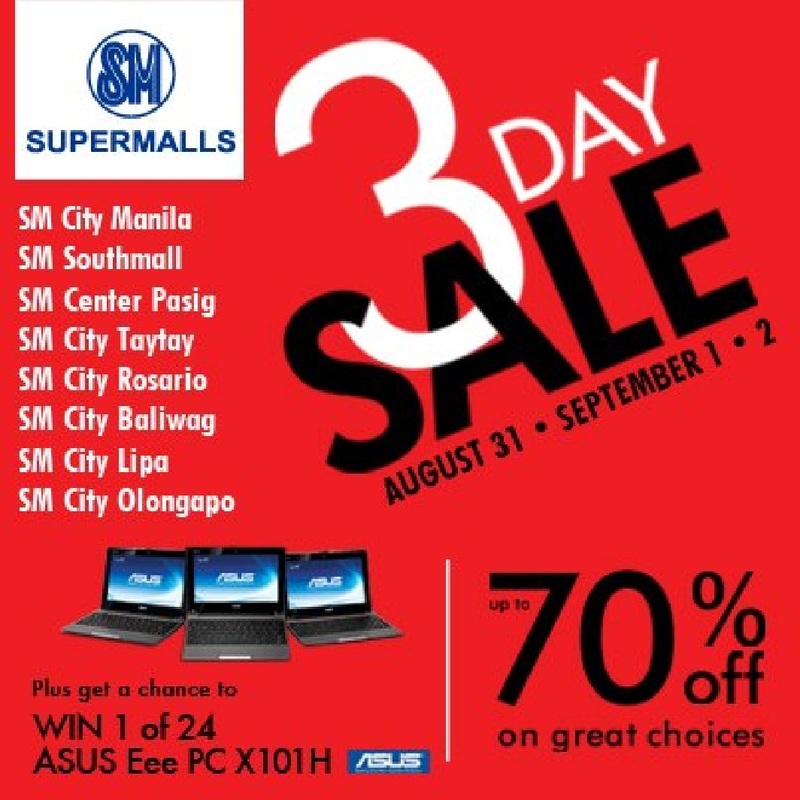 There'll be also a regular raffle promo where winners can win one of the three (3) Asus Eee PC X101H Netbook. 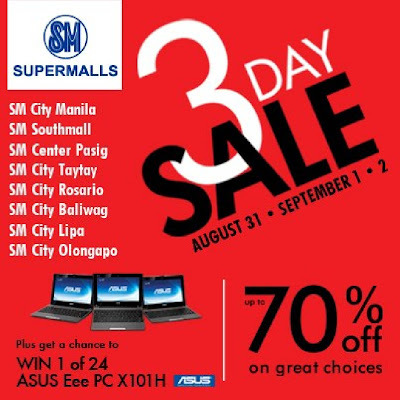 This promo is in line with the other 3-day sale happening in other SM Malls such as SM Manila, SM Center Pasig, SM Taytay, SM Rosario, SM Baliwag, SM Lipa and SM Olongapo. 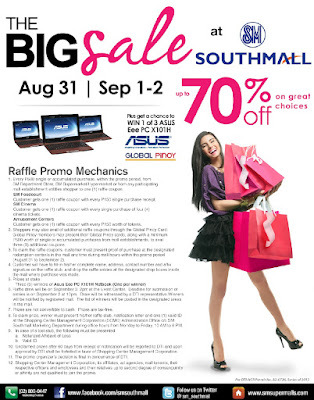 In every Php500.00 single or accumulated purchase, within the promo period, from SM Department Store, SM Supermarket/Hypermarket or from any participating mall establishment entitles shopper to one (1) raffle coupon. Customer can also get one (1) raffle coupon with every Php150.00 single purchase receipt at SM Foodcourt, (1) raffle coupon with every single purchase of four (4) cinema tickets at SM Cinema and one (1) raffle coupon with every Php150.00 worth of tokens at Amusement Centers. Shoppers may also avail of additional raffle coupons through the Global Pinoy Card. Global Pinoy members may present their Global Pinoy cards, along with a minimum Php500.00 worth of single or accumulated purchases from mall establishments, to avail three (3) additional coupons. To claim the raffle coupons, customer must present proof of purchase at the designated redemption center/s in the mall any time during mall hours within the 3-day sale promo period. Customer will have to fill-in his/her complete name, address, contact number and affix signature on the raffle stub, and drop the raffle entries at the designated drop boxes inside the mall where purchase was made. With all those promos and prizes, I can't help but to get excited! Hopefully, I'll get to sleep early tonight so that I can be there by 10 in the morning. 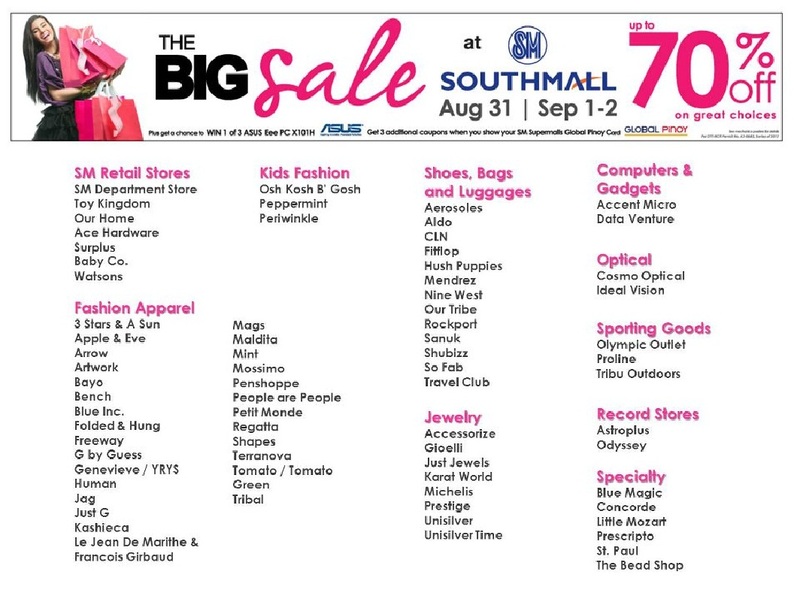 I also heard that there's an additional 10% discount to all SM Advantage Card holders, so this is gonna be super fun! Wee! See you, southerners! Happy shopping, everyone!